I went to see the Vivid Festival twice this year, and I must say that I completely loved it. On the first night, I visited Circular Quay. The light show there was stunning. On the other night, a few friends and I visited Darling Harbour. Unfortunately, it started to rain, and though the lights created beautiful reflections in the rainwater, it was pretty cold and wet, and therefore we didn't get to visit the other Vivid sites. Because of this, I am keen to hear of other people's experiences, and in particular, what you enjoyed most about Vivid Sydney 2014. 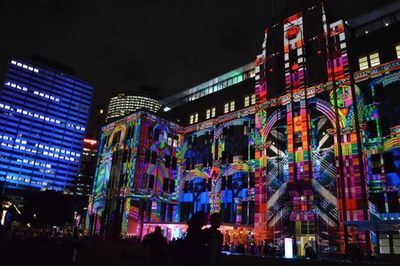 So what was your favourite part of Vivid 2014? All of it was amazing, yet if I was to choose a slight standout - Martin Place provided something a little different. Light was even shining on the private hotel there, and there were greater crowds than expected. I did not have much time to visit Vivid Sydney this year, yet I loved the moments when I did. I didn't go to Martin Place unfortunately! My favourite was the Contemporary Art Museum in Circular Quay. I saw many other incredible displays - the opera house lights were amazing and the water show in Darling Harbour was pretty enjoyable to watch, but the museum in Circular Quay was my favourite. We've been to every Vivid since it started in 2009 and have seen every attraction. I mark them off to make sure we don't miss any. Last year there was one missing and I'm not sure if No 25 was there this year (Cnr of George St,; there were lights reflecting onto a building so maybe that was it but there was not a pink post with the number on it!). We went twice last year as it is impossible to see Circular Quay, Walsh Bay & Darling Harbour on the same night. We went three times this year to capture them all. Usually Customs House is our favourite but this year our favourite was the Waterfall with words forming in it at Martin Place. Well done Destination NSW! I love seeing the Opera House and Harbour Bridge lit up for Vivid!